On my birthday (yesterday for those playing along at home), I had a lot to celebrate. First off, I can EAT ALL THE THINGS! Woooooo! So, no more pureed this and soft that for me (or you by proxy). Now we have nothing but delicious everything to look forward to cooking and eating together. In celebration of our shared new-found freedom, here is one of my favorite bacon dishes to whip up. On those mornings when the BF has imbibed a little too much the night before I greet him with this surefire headache + hangover cure. 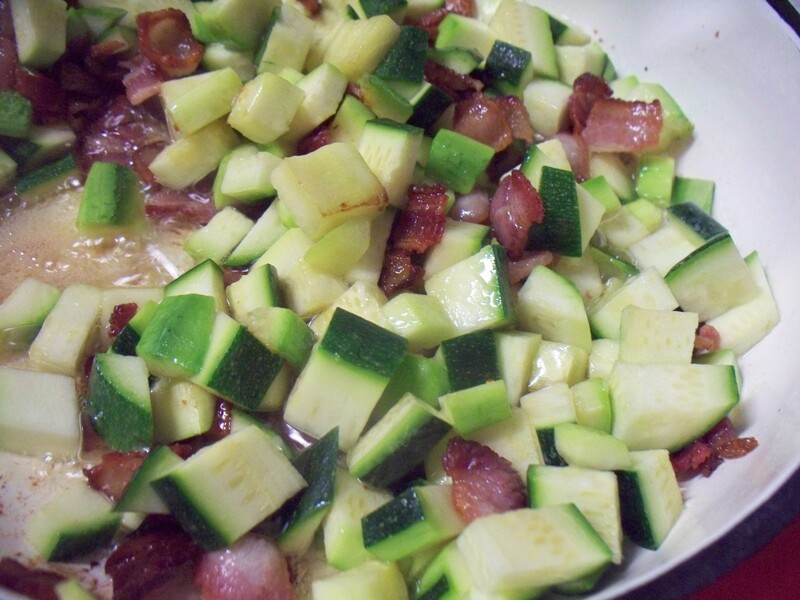 We have this often throughout the year—though it always tastes best in the summer when the zucchini is fresh from our garden—and this dish works great for an easy brunch or dinner. It is a dish which is a contradiction of being always and never the same, because it’s a great “kitchen sink” recipe where you can toss in whatever you have on-hand. I always include bacon and zucchini, sometimes shallots or tomatoes or a green apple, this time around corn and nectarine. I also add fresh herbs if I have any on hand like a handful of rosemary, or some thyme, or a few sage leaves fried in the bacon grease. If you make some hash, tell me what you did to make it your own! 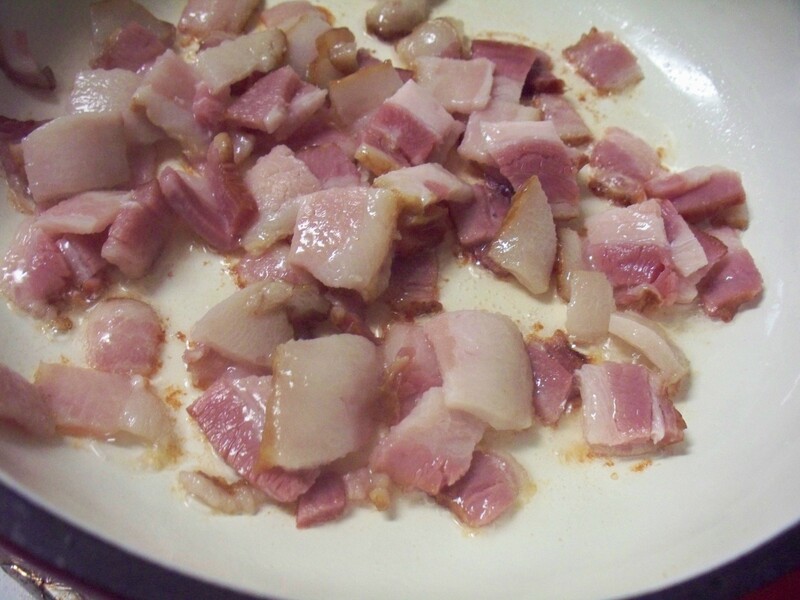 In a heavy or cast-iron skillet, cook the bacon pieces over medium-high heat until browned. Pour off some of the grease so that only a light layer remains in the pan. Add the zucchini and sauté a few minutes, stirring/tossing as needed (but not too often). 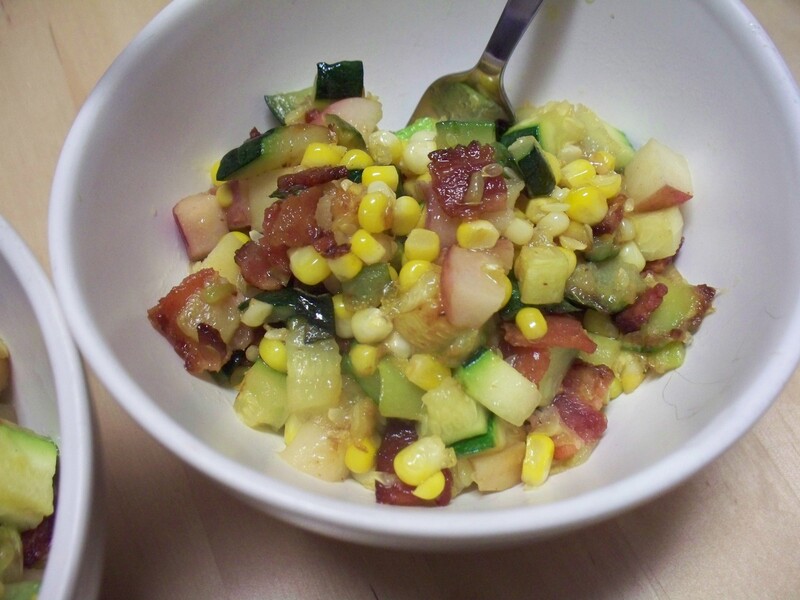 When the zucchini begins to get tender, add the corn and sprinkle in a little fresh-cracked pepper. Again toss to combine. Add the nectarine last because it’s the softest. If you want the corn softer, add it before the zucchini. 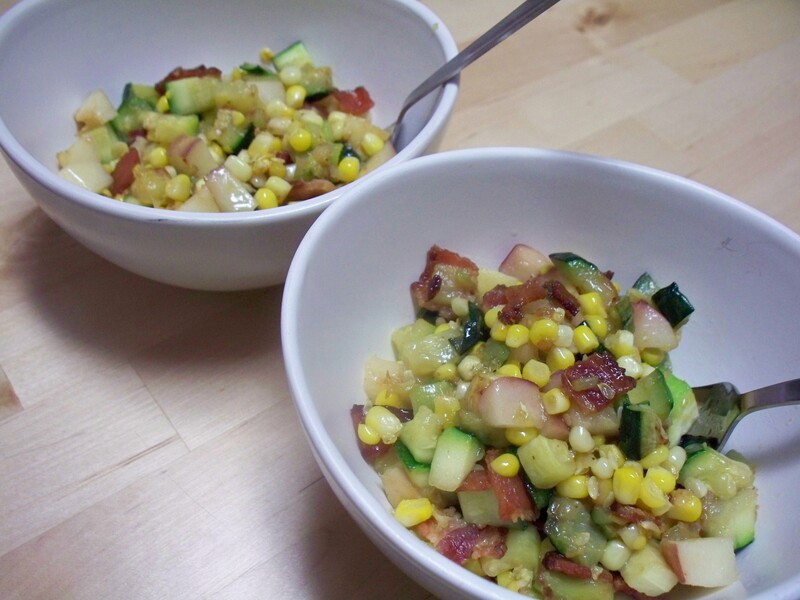 I like the texture of a good mix of the crunchy bacon, firm corn, softened zucchini, and warm fruit myself. Serve! 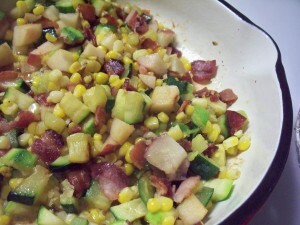 bacon, corn, leah charney, nectarine, zucchini, zucchini bacon hash. Bookmark the permalink. Post a comment or leave a trackback: Trackback URL.